I hope this finds you well. This is an update prior to my returning to Uganda, in two weeks time. (For those who have asked the question, I always pay my own fare – your donations are never used for admin or transportation). 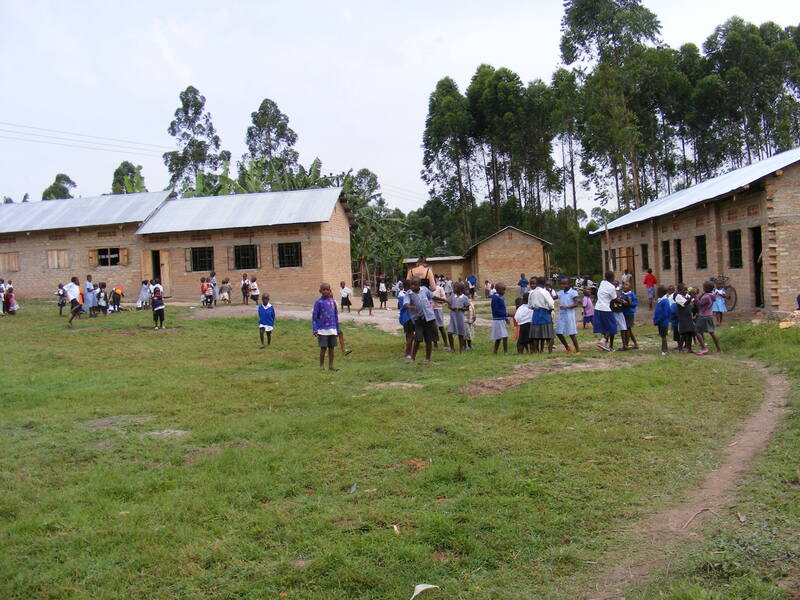 Last month we turned on the first water taps in Migorora village, Uganda Lodge and at our own Ruhanga Development School. Sincere thanks must go to Sally, Hilary, Sophie, Manisha, Heba and Sharky, and the many others who donated towards this fantastic achievement. We are already getting requests from further afield to supply them with clean water, but that is not our top priority at the moment. We have some ideas for starting income generating projects and are researching along those lines right now. I have started a page for donations at www.mycharitypage.com/RuhangaDevelopmentSchool However, any of you wanting to do a sponsored event amongst your friends, can set up a page specifically for your event from this website (this is similar to the JustGiving site but we do not pay any commission). At our school we have 7 classrooms with all plastering, flooring and painting finished and are on the way to completing another two. One will be used for the new P3 class in January and one will be for a badly needed office and staff room. Clement, one of our current volunteers has raised £1500 from friends and organised machinery to level the school playing fields so the children can safely do PE and play football etc. Denis is building another toilet block for teachers and the older girls to use. I know some of you donated money directly to Denis while you were in Uganda – if I can have your details it may be possible for us to claim Gift Aid on this money. I would also like to put a board up at the Lodge acknowledging all our larger donors – say over about £100? Last month the whole village was devastated by the tragic loss of a 4 year old little girl in our Baby Class. She was knocked down by a speeding car on her way home from school and we are again petitioning for permission to have speed humps out on the road. The school is moving forward fast; the children are learning English quickly although they are still very shy if we try to video them! I will give a fuller report next month as I know that many of you, especially those who are sponsoring or fundraising, would like more frequent and detailed reports. Please bear with me as £3.50p a month does not enable us to pay admin staff, we rely entirely on volunteers to run the scheme and all the money collected goes out to the school. If your renewal is due or you have not started your standing order please can you send in the money this weekend or let me know if you are no longer able to sponsor, and thus give your child the chance to find a new person. I now have a volunteer who has started a new Facebook page at www.facebook.com/ugandalodge and he is adding posts, photos and videos. Please click the “like” button when you log onto it. If you are considering a trip out to Uganda, please contact me and I will be happy to provide information on Charity Flights. It is already getting difficult to find cheap flights during July and August due to the 2012 Olympics. If anyone who lives in the Surrey area is looking for somewhere to go tomorrow afternoon, then you may want to come along to our charity AGM which is to be held at Ashley Park Hotel, Walton-on Thames between 16.00 and 18.00. Apologies for the short notice – it was brought forward due to my trip later this month.